DECATUR - To the untrained eye, it looks like a simple strip of tape, something middle school students might use to put the finishing touches on a science fair project. But three local nurses are hoping others in their profession will recognize their invention as a gift that offers a better way of doing a common task. After six years of development, Tapease, a product that originated in the minds of nurses Sue Hesse, Mable Davis and Jeania Kitchens, is reaching the market. It is designed to make securing IVs faster, easier and safer. "We realized that we really had something that would work and could benefit nursing and would benefit patients," said Hesse, a Decatur Memorial Hospital nurse. All three women were working at DMH when one day, they started discussing obstacles that arise when taping an IV in the traditional manner. Tape is usually torn off of a roll, stuck to another surface and almost always sticks to gloves, Hesse said. At first, the women tried to come up with a method for preventing the gloves from sticking to the tape, but once they switched their focus to modifying the tape itself, they realized they had something. "I was amazed at how they'd thought of that," said Dr. Joseph Schrodt, a Decatur orthopedic surgeon who has been instrumental in helping the nurses patent their idea. "They did it over a kitchen table." Tapease is remarkable in its simplicity, Schrodt said. It prevents the sticky side of the tape from adhering to one's gloves with the placement of removable tabs that are peeled off one by one during the taping process. 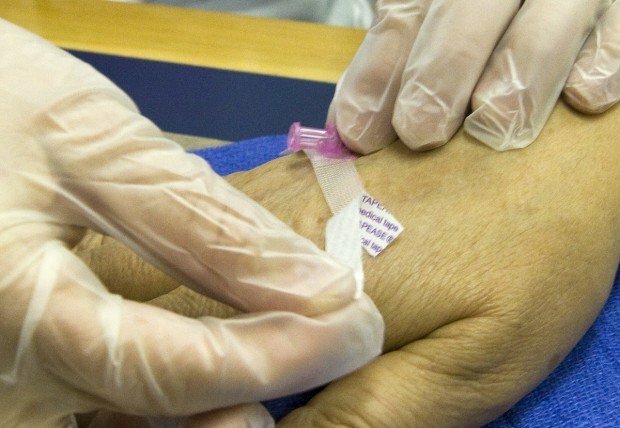 This allows the tape to remain sterile the entire time because it doesn't have come into contact with surfaces such as an IV pole or table, thus reducing the patient's risk of infection, he and Hesse explained. 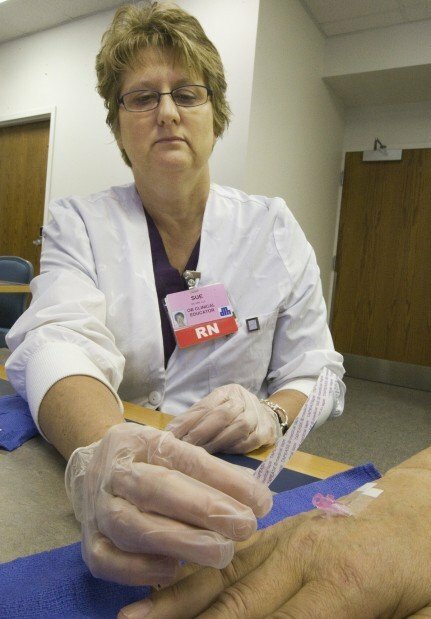 "No one does that to intentionally transfer anything to the patient, but you do that because you have to do that to facilitate taping the IV," Hesse said. The improved process can save several minutes, she said. "It doesn't sound like a lot, but it is." Removal of the tape is easier, too, as there are permanent, nonsticky tabs on each end of the Tapease strip to give gloved hands gripping points, Hesse said, as she demonstrated the device on Schrodt's hand. Schrodt said health professionals sometimes are reluctant to embrace change, but he doesn't anticipate any resistance with Tapease because it improves a task without changing it drastically. Tapease's developers say that the product is anticipated to help reduce healthcare costs. Perhaps the biggest obstacle for the group was getting the U.S. Patent and Trademark Office to believe that nothing like Tapease existed, Schrodt said. It took four visits to Washington and the assistance of patent attorney Alvin T. Rockhill. Millikin University, Richland Community College and hospital leadership have been supportive throughout the development process, said Hesse. St. Mary's and Decatur Memorial hospitals have ordered the strips and are instituting trainings to ensure that staff members are familiar with their use. DMH plans to transition to Tapease after using up its existing stock of traditional taping supplies. "We've talked to nurses in the hospital, and they seem to be very excited about it," Hesse said. "It's very easy to use and seems like a no-brainer," said Gail Fyke, a clinical nurse specialist at DMH. "It seems like, ‘Why wouldn't we do it?' "
Fyke said she has been talking to area nurses and nursing instructors about the product and how it will benefit patient safety initiatives in addition to making taping easier. "She's impacting every department in this building with this change in practice," she said of Hesse. Hesse said she would like to see more hospitals show an interest in her product and its benefits to patients and staff. "We think it's really exciting that a small hospital in Central Illinois is the starting place for something that could possibly be something very huge in nursing," she said. For more information visit www.tapease.com.